Leadership to Engage Gen X’ers and Boomers needs to be reconsidered post Recession 2008. Things are not the same. Gen X’ers are those born between 1965-1978, and there are about 46 million of them. They actually have more influence in the workplace than Baby Boomers or the Millennials. They are thought to be a critical group when it comes to back filling Leadership for the Boomers who ordinarily would be preparing to retire. It’s just that we had this little ole dip in our 401k’s. So the Gen X’ers are restless. Boomers are trying to hold on a few more years to sock away some more dough. The Millennials see this as a fine time to move on in. 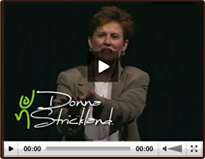 Posted by Donna Strickland in Employee Engagement, Leadership and Team Development. We know some very important things when it comes to patient satisfaction: food and nursing. If the food is great and the nursing is average, a patient is likely to not recommend the hospital. If the nursing is great, and the food is average, the patient is likely to recommend the hospital. We know that good food is better than lousy food, friendliness counts more than good food, when information exchange takes place, communication counts more than friendliness, and empathy enhances communication. So simple, right? It’s just that we forget. So, acknowledge the patient-your customer, say hello, good morning, howdy, how are things going for you? But acknowledge them. Introduce yourself. Let them know why you’ve entered their room and what you need to do, how long it will take, and explain anything to them about what is about to take place. Guess what? No surprise here. The higher the staff engagement, the higher the staff retention. The more unresolved the conflict is on any given team, the more likely you are to lose your best staff, your “high fliers”. High fliers tend to leave first. They can get another job easily. Team Development is one way to establish “rules of engagement” for a team, and one of those rules of engagement is how the team will deal with differences and conflict as they arise. What have you noticed about your retention of staff related to staff engagement? I would to love to hear your thoughts! How is Leadership Development Related to HCAHPS scores? When it comes to HCAHPS scores, nursing has a huge role. To expect that nurses will truly be engaged with patient care in the way that CMS is measuring it, Leadership has to be truly engaged with nursing. And, let’s face it, the higher the customer satisfaction scores, the higher the profits of that organization! I’ll write about several of the most important factors when it comes to patient satisfaction scores. And, this really isn’t for healthcare only. These same principles apply to any industry when it comes to building a culture of service excellence. There are a multitude of “customer service educational programs” out there. Although there are numbers of things that matter to customers, one of the biggest is “Service Recovery”, which is the resolution of customer’s problems.